Daily Illuminator: Learn To Play Munchkin Magical Mess At 2nd & Charles! 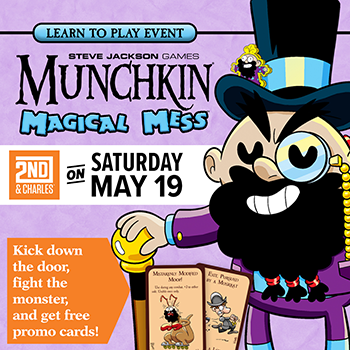 May 15, 2018: Learn To Play Munchkin Magical Mess At 2nd & Charles! The mischeivous Moop is mixing up monsters again, and you can get in on the fun at participating 2nd & Charles stores on May 19! Munchkin Magical Mess features a host of new mixed-up monsters and our favorite wizard, Moop, in a brand new deluxe-style game! Our friends at 2nd & Charles are getting in on the fun with a host of events where you can not only learn to play, but get some free loot, too. If you haven't checked it out yet, you can find out more about Munchkin Magical Mess from our Designer's Notes, where Andrew Hackard and Steve Jackson talk about the design process, and highlight some of the awesome cards in the set! If you take pics of the event and share on Twitter, Facebook, or Instagram using the hashtag #PlayMunchkin, you'll also have a chance to win even more free swag! You can find a participating store near you on our website. Check out an event, snag some promos, and get mixed up this weekend!